Prenuptial Agreements: What You Can, Cannot Do! 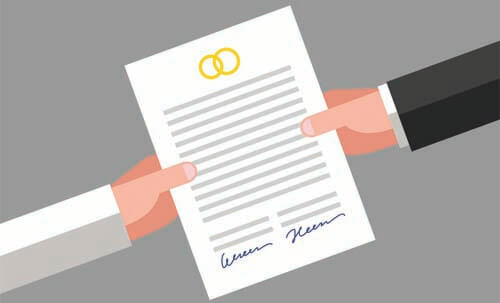 In 1981, the Michigan Legislature adopted a statute allowing for prenuptial agreements. The statute stated, “a contract relating to property made between persons in contemplation of marriage shall remain in full force after the marriage takes place.” (MCL 557.28) That being said, for many years the Michigan judiciary did not permit premarital agreements to be enforceable when it came to divorce, allowing them only to be used upon the death of a party to the marriage. In 1991, that changed. In the court decision, Rinvelt v. Rinvelt, the court ruled a prenuptial contract is enforceable, even when it is made in contemplation of divorce. That being said, for many years, courts found ways to escape the enforceability of a prenuptial agreement, especially when the terms of the same appeared to be harsh. Different courts found that if there was a mistake, fraud, duress or non-disclosure of a material fact, then the agreement could be avoided. Other courts found if the agreement was so one-sided, it was “unconscionable” and, therefore, unenforceable. While other courts found that when facts and circumstances had materially changed from when the agreement was entered into, enforcing the same would be unfair or unreasonable. See Reid v. Reid (2005). Things have materially changed again based on the most recent court decision, Allard v. Allard (January 2017). In Allard, the court held that parties to a prenuptial agreement cannot abrogate the trial court’s authority to exercise its own judgment and make equitable decisions under two specific statutes: MCL 552.401 and MCL 552.23 (1). These two statutory provisions permit a trial judge to invade one party’s separate property, i.e. property that they typically owned before the marriage or acquired during the marriage from inheritance or a gift, when to do so was called for by the judge to “do equity” in the divorce case. Typically, the judge would do this because there were insufficient assets for the suitable support and maintenance of one party, or when one party acted during the marriage to improve the separate property of the other. When the dust settled from the Allard decision, the court ruled that the parties to a divorce action cannot, through a premarital agreement, compel a court of equity to order a property settlement that the court believes to be inequitable. Although the parties have a fundamental right to contract as they see fit, they have no right, currently under the law, to take away the court’s power to be fair and equitable to both parties, as the parties divorce. The court ruled to the extent that the parties’ prenuptial agreement attempts to limit the trial court’s equitable authority, it is necessarily void as against both statute and the public policy codified by our legislature. The impact of the Allard decision has raised many questions within the area of family law. The first question is, what happens to existing prenuptial agreements that many attorneys previously drafted for their clients? Will any of these premarital agreements still be enforceable? All parties to prenups, and their attorneys, should be concerned about the impact of the Allard decision. The court specifically did find that premarital agreements are enforceable, as long as they do not restrict the trial court’s authority to do equity. The Allard decision indicated that premarital agreements are helpful to the court to identify separate property owned by each party before the contemplated marriage occurs. Again, it needs to be kept in mind, that the assets that are identified as one party’s separate property coming into the marriage will not be invaded, unless equity and good conscience of the trial court judge requires doing so. A good thought process here is that when making a premarital agreement, it is important to be fair in doing so and consider changing the benefits to one party that might flow after the marriage has lasted for a longer period of time, and also to take into consideration whether it is contemplated that there may be the birth of children that occurs as a result of that marriage. The key thing to keep in mind with premarital agreements is that assets that are accumulated or debts that are incurred during the marriage are treated differently by the court than assets that were owned by each party before the marriage. If you can view a marriage as a business partnership, all assets that are acquired or debts that are incurred after the parties say, “I do,” until the parties are divorced are treated differently. Typically, inherited assets are viewed as gifts to one party, and not the product of hard work and labor of either of the married partners. And, as long as those assets are not “co-mingled” and turned into marital assets, the court will generally keep them separate when dividing marital assets in a divorce. That being said, if a party inherits a home and then during the marriage, over the next five or 10 years, both parties work hard to refurbish the home, paint it, make alterations, etc., the court can then treat such improvements as marital improvements and award the other party, who didn’t inherit that property, a portion of the value of such improvements. Bottom line? Premarital agreements are helpful to the court. But, per Allard, those premarital agreements cannot prevent invasion of separate property or the award of spousal support, if the court believes that the same is necessary in order to be fair and equitable, considering the length of the marriage and what the other party will receive upon dissolution of the marriage. Make sure to always consult an experienced family law attorney, well in advance of the contemplated marriage if the desire is to protect one’s separate estate from being invaded upon a divorce.